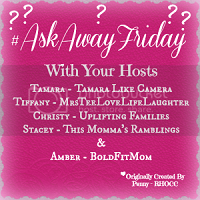 Ask Away Friday number two and I got two interviewees for the price of one! I swapped with Ana and Frank, an American expat couple living in Croatia. I had fun browsing round their blog Our Blended Marriage which is about surviving in a blended marriage and much more. I have to admit, I’d never heard the term blended before but I learnt a lot by reading the posts of this interesting family. I discovered that despite our very different backgrounds, Ana and I share many completely random likes and interests. 1) Halloween is just behind us, I am curious, do you celebrate Halloween in UK or not? If yes, did you dress up with the kids or no? Yes we do celebrate Halloween in England though maybe not as much as the Americans do. We go trick or treating and this year I organised a Halloween / bonfire party in our woods for my girls and their school friends. The children all dressed up filling the woods with witches, vampires and skeletons. I set out a spooky trail for them to follow and we cooked a witch’s stew on the camp fire watched over by our pumpkin lanterns. As it went dark we toasted marshmallows and my husband did a firework display. I didn’t dress up this year but I do love dressing up if I go to a Halloween party. Last year my friend said “You’re a mad cow, you’ll dress up won’t you?” so I decided to have a break from the usual spooky costumes and went as a mad cow! 2) Since we are getting into the holiday season, what is your favorite holiday? Why that one? I have always loved Christmas. It has a special feel to it especially if we’re lucky enough to get snow. For me it’s about getting together with family, eating far too much and just relaxing. By far the best thing is experiencing the magic with my children. Seeing their eyes light up on Christmas morning as they come downstairs is so magical, then a flurry of flying paper and squeals follows. Next we set off to my mum’s house for a gargantuan feast, big enough to feed an army and another pile of presents to open. Father Christmas always makes two stops for my lucky girls! Once the mayhem has died down, we relax on the sofas and chat in front of the open fire – bliss! 3) One more “holiday” question and I promise I will stop: What’s the best/worst gift you have ever received? One of the grandest presents I received from my husband was a surprise dawn flight on a hot air balloon. It was quite amazing to watch the fields just drop away then drift with the clouds. Some of my favourite presents I’ve received have been handmade by my children. I’m not always entirely sure what their pictures are of but I treasure the thought that goes into them. Every shelf and cupboard door is adorned with their creations. 4) Thank you for introducing me to thunks! Now I have a word for those questions that my kids ask that stump me! Among the favorite thunks you mentioned, pick one that you would like answered most? 5) I love your The Birth of Sylva Fae story and that you were able to create a little haven of magic for your kids. How important is it to you to keep the magic alive for your girls? I want my children to grow up having a little taste of the childhood I had and not just sit in front of a TV or computer. I want them to have an appreciation of nature and the outdoors, to be able to create their own fun and not rely on some electronic device. It is magical to create them a fantasy world of faeries, it inspires our activities and the stories I write. Of course, it’s also a fabulous education for them, learning new skills and about nature. 6) If money was no object, where would you go for your dream holiday? I said in my last AskAway Friday that I’d love to go back to Mexico to show the girls the beach where we got married but that’s something for the future. On a more festive note, we have just booked a Christmas holiday, with my mum, to stay in a cabin in a forest. I’m really excited about it but we’re keeping it a secret from the girls for now. I can’t wait! 7) Aside from UK would you like to live anywhere else? England will always be my home but I love travelling. I have an aunty who lives in a cabin in her own forest in Canada. It would be amazing to live over there for a while and my mum would love to spend more time with her sister. 8) What’s your favorite childhood memory? For a few years we had a house in the grounds of Naworth Castle. We had fabulous summers playing in the countryside there. When the lord of the castle decided to open it up to the public, he wasn’t very organised. He called on me and my mum to help out an hour before the first coach load of American tourists arrived. As an artist, mum went to the gallery and I took on the library complete with minstrels gallery. I knew nothing of the history so had to make it up convincingly on the spot. By the end of the week, I had some fabulous stories to tell of the ghosts who still haunted the library. My tourists loved it and went away happy. I seem to remember I got paid in Easter eggs and mulled wine. Apologies if you were one of those tourists! 9) What is your best quality? What’s your biggest flaw? I am a planner, obsessively writing lists and organising things. I think this qualifies as my best and worst quality. I’m happiest when I have a children’s birthday party to organise. I drive my husband mad as I attempt to do everything myself and I’m rubbish at delegating. I micromanage everything and become insufferable. But then when the cake is decorated, costumes handmade, buffet prepared, entertainment planned and party bags are filled, my girls have some pretty super parties and I finally relax and enjoy the fun. 10) What was your favorite cartoon while growing up? Scooby Doo! I loved a good mystery even back then, though watching them back now with the girls, they seem so tame. Hi Jill, AskAwayFridays are fun to do but I’m still learning what it’s all about! Maybe we should swap sometime soon, I’ll check out your blog. Thanks for your comments, the Frozen outfits were fun to do but were hard work. They were my first attempt at proper dressmaking and I was quite pleased with the finished results. I look forward to reading your AskAways. I agree Scooby-Doo was the bes cartoon. Then came Save by the A Bell in middle school. Oh yes, I loved ‘Saved by the Bell’ too.